Here is a quote from one of the pastors who brought in Little Tommy. 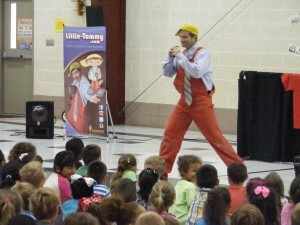 Tom Toombs and Little Tommy bring “Anti-Bullying” assembly to Caldwell Elementary and Intermediate students. On Sept. 10th, the Caldwell Area Minister’s Alliance with the support of the Christian Care Store, brought national Children’s speaker Tom Toombs to the Caldwell Intermediate and Elementary schools. Tom entertained the kids through comedy, magic, juggling and mime. The atmosphere was electric as the performer showed why he has written and performed at Dollywood and done work for the Billy Graham Evangelistic Association. His message was aimed at kids realizing that bullying takes place when kids don’t like themselves. He taught that we all need to be Encouragers instead of Discouragers. He gave several examples of kids who overcame bullying experiences and became difference makers. Dr. Ben Carson, the nations leading pediatric neurosurgeon was once bullied in school but overcame feelings of resentment and went on to attain top recognition in the country as he was the first to separate conjoined twins at the brain. From the moment of his introduction we experienced a high energy ride of laughter and entertainment! 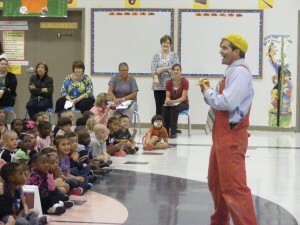 The kids were transfixed with every movement and word. It was amazing how Tom used the simplest things to entertain. I had forgotten that so many things could be funny! Tom spoke to us about the harms of bullying and that everyone can overcome bullying by learning to become an encourager rather than a discourager. The Principals, Teachers, Coaches, and Staff were just as entertained as the kids! Tom will receive an invitation from us again! I wholeheartedly recommend Tom Toombs for your event!